View of “Antony Gormley: Event Horizon,” 2015–16. Recent public art in Hong Kong has tended toward the lighthearted. Florentijn Hofman’s giant inflated Rubber Duck floated in the harbor in 2013 and Paulo Grangeon’s sixteen hundred papier mâché pandas appeared in flashmobs around the city in 2014. 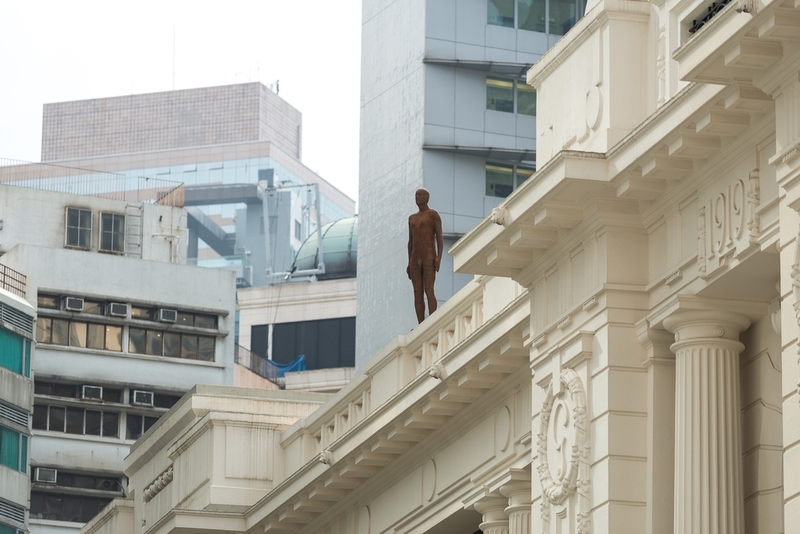 Antony Gormley’s Event Horizon, 2007, is a more cerebral public art project and a response to the island’s condensed and vertical environment. The artist compares his installation to acupuncture: minor displacements realigning the energy of the urban habitat in a healing way. Gormley’s thirty-one life-size iron sculptures are indexical copies of the artist’s body. Many are positioned on key rooftops throughout Hong Kong’s Central district, such as city hall, the Standard Chartered Bank Building, and the Central police station. In cosmological physics, “event horizon” refers to the limit of the known universe. Here, scattered across the cityscape, the works expand our understanding of how we interact with space and with others, and they question how the built world relates to an inherited earth. The surprise of glimpsing a human silhouette against the sky might be troubling to some observers—the connotation of suicide is unavoidable. For others, a game could be made of spotting all thirty-one. The project began in 2007, when it was reported that half of the planet’s population lives in urban centers, and it has toured several cities since. Gormley’s eloquent installation is a call to mindfulness in a hectic and densely built-up place, encouraging us to be still for a moment and look up.